“Sash cords” or also sometimes called “sash ropes” make the sash window operational. Some people refer to sash cords as the “Sash” or the “Sashes” which causes confusion as sashes are the two timber sliding parts of the box sash window that contain the glass. One end of the sash cord is connected to the sliding part of the window called the “Sash” and the other end of the sash cord is threaded through the pulley wheel and connected to a cast iron sash weight hidden inside the box frame. There are two sliding sashes in a box sash window frame, an “Upper Sash” and a “Lower Sash” each of these sliding sashes have two sash cords connected to it, one on each side. If the sash cords are starting to fray this is a clear indicator that the cord is about to snap, if any of the sash cords are frayed it is advised that the sash window should not be operated and should be kept locked until the sash cord or cords have been replaced. If the top sash is not sliding up to the top of the box frame this could be an indication that one of the sash cords or both cords in the upper sash may be broken, worn or frayed, it is highly recommended that if you suspect that one or both of the upper sash cords have snapped or are likely to break, you should not attempt to operate the window and the sash window should be kept locked until the sash cord or cords have been replaced. If you lift up the lower sash from the inside and the lower sash slides back down this could be one of two things, the first would be that either one or both of the sash cords may have broken making the sash two heavy to operate on one or no sash cords, causing it to slide back down. The second is that the weights for the sash may have been replaced at some point and are not heavy enough for the sash to operate, the sash will need to be re-balanced with heavier weights, the sash cords would need to be replaced if re-balancing is needed. If the sash cords have been painted over it is advised that the sash cords should be replaced as the layers of paint make the sash cord or cords brittle and are liable to snap. The most obvious sign is that you can visibly see the snapped sash cord or that a sash cord is visibly non-existent. 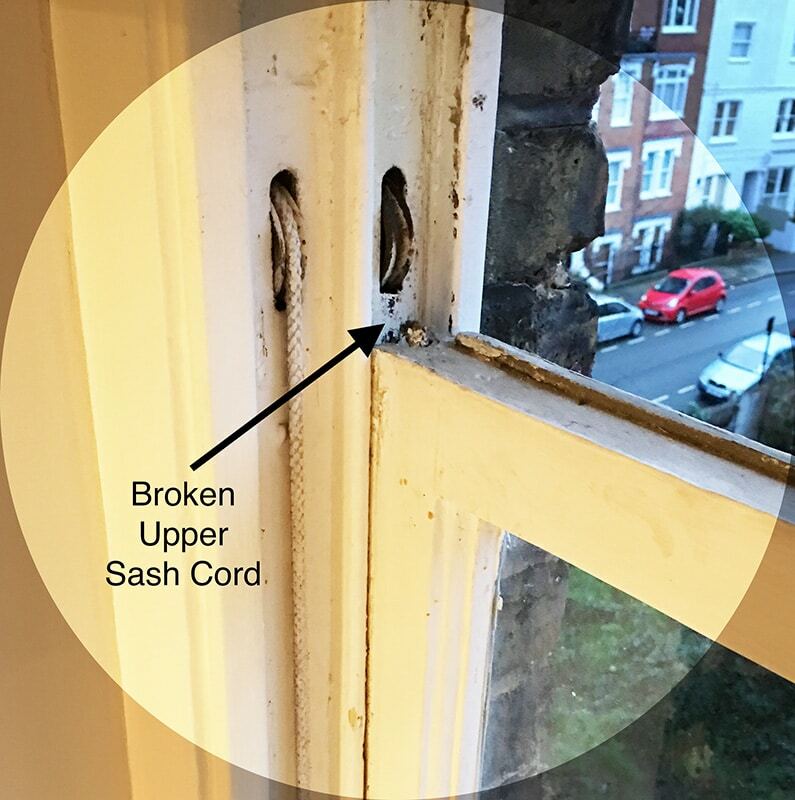 Firstly, take a look at the photos on this page to determine whether it is the upper or lower sash cords that will need to be replaced, if your not entirely sure what sash cord needs repairing, don’t worry just give us a call and one of our team will be able to help. Give us a call to arrange a time and date carry out the sash cord repairs, on most occasions one of our team will be able to do the sash cord replacements on the first initial visit to your property providing there is nothing obstructing the sash window like secondary glazing or plantation shutters etc. We use braided polyester sash cord which is strong and will not stretch. Our sash cord has a 330Kg breaking strain so is suitable for single and double glazed sash cord replacements. Landlords and Managing Agents should inspect cords in rented properties on a regular basis. 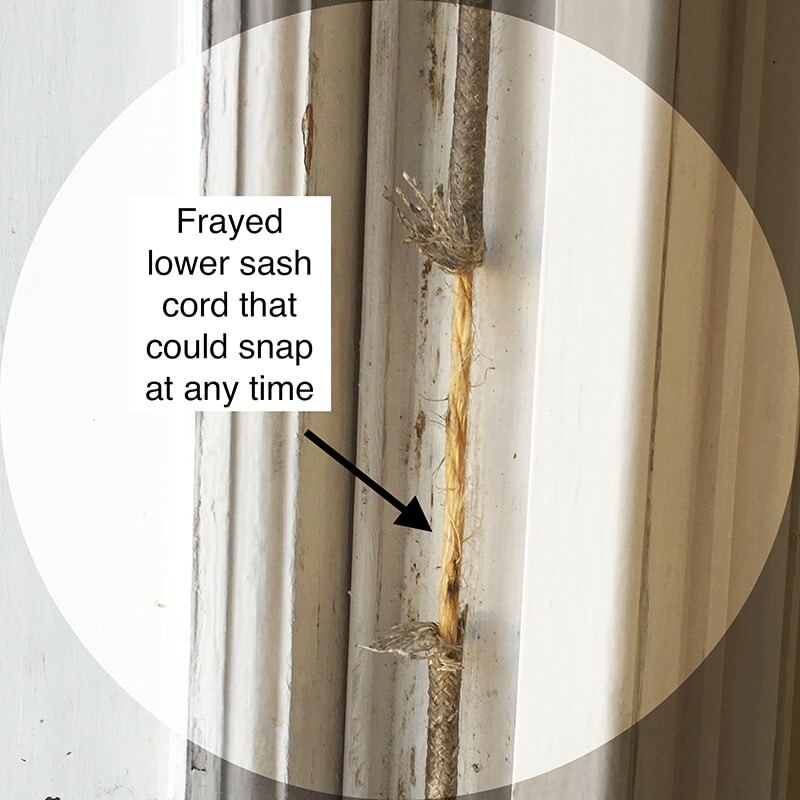 If a sash cord is broken on one side of an upper or lower sash, there is a high risk that the other cord will snap, causing the sash to fall down and the glass to break. Not only is the cost of repairing the cord and the broken glass an unwanted extra for the landlord or managing agent, there is also the issue of due care and safety to the tenant. 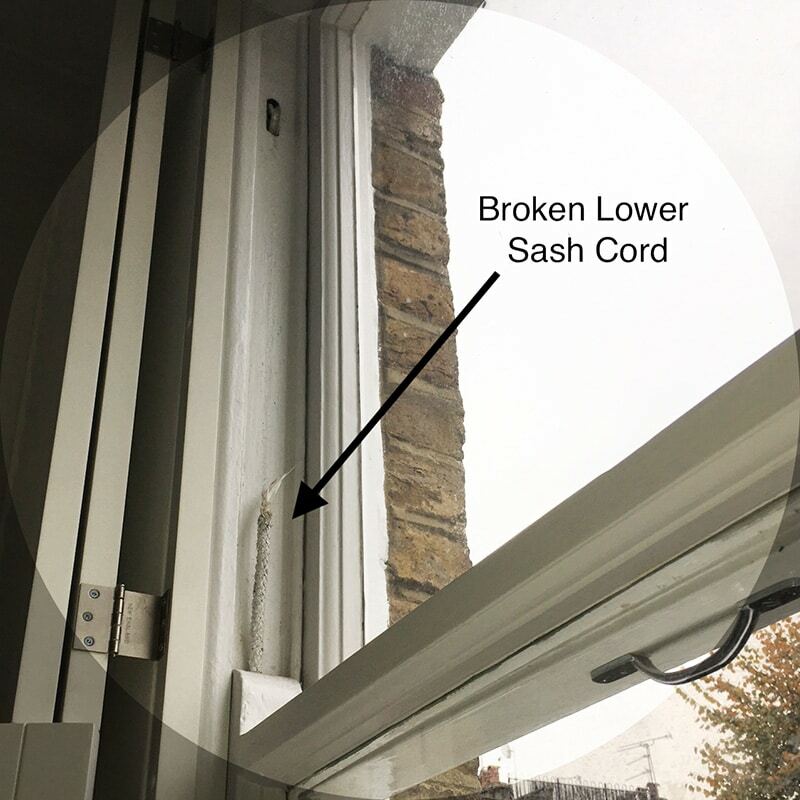 If the one remaining cord snaps and glass breaks while a tenant is using the window the risk of injury occurring is a high probability, especially if children are in the property, due to the height of windows.